Despite the field production constraints, sometimes production exceeds local household consumption levels in certain bumper harvests periods of the year ushering in new challenges such as wastage due to rotting of fresh tubers. This is further exercabated by poor post-harvest handling and low prices of fresh tubers. In order to avoid post-harvest losses, farmers have been engaged in traditional processing through peeling and drying chips to make flour and other products like lira-lira or waragi (MAAIF, 2010). Lira-lira is bioethanol produced through fermation of cassava flour. Indeed the process for making this ethanol is so dear to the people of Apac that they have already selected specific varieties for production of ethanol. The production process and the recipes added there in are also specific to this area. They are either variant of known ethanol production process and/or with specific tweaks and processes that make ethanol production unique to this area. What is interesting too is that the process is mainly carried out by women and sometimes children. Stories have therefore been told on how children that went school using “alcohol” have become members of parliament, ministers and other important leaders in Uganda. This serves to explain the economic importance of ethanol to the people in this area and why to some extent, the activities in ethanol production are dear to their hearts. Cassava flour mixture being roasted on metallic pans – an activity that is mostly done by women. The process starts by identifying the specific variety to be grown by the farmers intending to produce ethanol. The preferred variety here is locally known as “gamente” (read as government) which implies that the initial variety was supplied by government agencies. The variety is the popular improved variety NASE 14 which was supplied by various agencies and was bred by the cassava program under the National agricultural Research Organization (NARO). This variety with high yield and specifically having other critical yield properties is also high on starch content and an appreciable amount of dry matter. Of greater importance is the variety moderate tolerance to the devastating cassava brown streak disease (CBSD) and its resistance to cassava mosaic disease (CMD). Thus its popularity among farmers is a fairly understood concept. Its high starch content could also allow it to be used for ethanol production by providing a higher amount of sugars that can be translated to ethanol after hydrolysis. The cassava grows for a period of between 12-15 months and is already for harvest. After harvest, the cassava roots are immediately peeled and there after washed in water. The roots are then chopped to reduce the bulkiness. This is also meant to increase the surface area to allow the faster drying of the roots. However, the chip sizes will also depend on the root sizes, the person chopping and other factors. The chopped roots are then sun dried for a period of between 4-10 days depending on the season, weather patterns and drying infrastructure. The dried chips are then milled into flour. It is this flour that is prepared for fermentation. The milled flour is mixed with water to form a paste of mixture. This is followed by covering either in a polythene bag (black) or in some instances banana leaves. Where need be, this covered mixture is inoculated with microorganisms by using a polythene bag that was used previously. This allows for whatever organisms that was present earlier to infest the new broth that has been added. The covered mixture is allowed to ferment for about 3-5 days. This process is critical since it forms the initial hydrolysis of starch into sugars. The process seems to be highly anaerobic and allows for degradation of starch to sugar without further utilization of this sugar by any other organism. Indeed from our analysis, during the Cassava CARP Project, it was realized that the sugar content after processing increases almost five fold. However, such a process is not as efficient in conversion of starch to sugar and hence would need to be improved. After uncovering it, this flour mixture is then roasted on metallic pans. The roasting procedure is as interesting as it not only allows further breakdown of starch into sugars but indeed introduces a certain form of “aroma” into the product that would later determine acceptance. Roasting indeed improves the sensory properties of the final product with part of the aroma being carried into the distillate after distillation. With the broth roasted and the mixture well prepared, the broth is then added to water in drums/pots prepared in a particular corner of the household. The roasted broth is well mixed with water by making sure that all the crumbs have been reduced to dissolvable matter by mashing with the hands. The amount of broth available also determines the amount of water which is measured using specific jerry cans. For example, for each basin of the broth, 2 jerry cans of water will be added to the fermentation drum. The interesting bit about this is that the producers insist it has to be in the corner of the house and in a very dark place. With the broth mixture sugar content already increased through various hydrolytic procedures, the fermentation process is set in motion. In this dark area in pots or drums, which contained the earlier yeast and other microorganisms (inoculants), the original cassava is slowly turned into ethanol and with varying levels of methanol. Our analysis of the fermenting broth showed that it is always rich in terms of the type and number of microorganisms that the yeasts, bacteria, and fungus co-exist in this mixture and are believed all to contribute to the ongoing process. However, such a cocktail of organisms, each doing its own activities, is the reason why such a process should be optimized at a local level. Such optimization would not only enhance the efficiency of the process, but would also provide for the production of the targeted product and reduce on the production costs. The fermentation process is allowed to go on for at least five days. The extended period is meant to allow for the utilization of all the sugars in the broth. Locally, it is believed that the extended process allows for production of a strong and “knocking” distillate. This may suggest that the longer fermentation times may sometimes result into increased production of methanol which is poisonous and may explain the knocking experience. After successful fermentation, and depending on the amount of fermented material, preparation for distillation is geared up. The process may take men down to the nearest stream that has cold and fresh flowing water. For the women, children and men with little to distill, the process takes them to the back yard. Depending on the amount of the fermented materials, cooling may be done in the backyard or near rivers. In the back yard, pots containing the fermented mixture are then set on this fire. On top of these pots is a small saucepan or any heat resistant container filled with water. This forms the cover but will also form the cooling apparatus much needed during fermentation. The water in this container has to be kept cool by a constant re-fill of the container while removing the water as its temperature rises. The fermented mixture is heated so as to drive out the ethanol at its evaporation point. The gas (vapor) which is laden with volatile organics including ethanol is driven off from the fermentation mixture. This gas is channeled to the connected copper pipe, where as it moves, it is immediately cooled. Since the copper pipe is coiled around, this allows the gas to move through a distance of cooling fins as it is slowly turned into a liquid. The liquid (distillate) is then channeled into the distillate handling container well positioned at a distance to receive the much treasured distillate. Down at the river, the process also takes almost similar steps. Here the big metallic drums, are loaded with the fermentation broth. No need to filter the broth and in fact, whatever was fermented is loaded into these seemingly fire resistant drums. The drums are set on fire and heated. Meanwhile, these drums are also connected to a copper wire which channels the vapor from the heated drum to the copper coil, smartly placed in the stream of water. The outgoing fresh cold water interacts with the incoming vapor from the heated drum placed in a slanting position. The extension of the copper wire from the coil is placed in a waiting plastic jerry can. Such an arrangement allows total condensation of the vapor into the distillate which is then collected as marketable ethanol ranging from 10-40% ethanol concentration in some instances. When required the distillate can be re-distilled in a concentrating process which aims at increasing the ethanol content and produce what would be a premium product (about 40-65% ethanol). The re-distillation procedure increases the value of ethanol. However, it is so costly and the concentrating mechanism also concentrates other low carbon organics such as methanol. One would ask then, who determines that the concentration reached is the right concentration? This complex question is answered by use of the readily available “chief testers” that do qualify a distillate to pass as marketable grade. However, the “chief distillers” have also mastered the art of distillation. This is based on the amount of fermentation broth loaded, how long it was fermented, the “fire” supplied and interestingly the type of cassava (cassava variety) used; and how much they would expect to get. Once such volumes have been attained, the chief distiller orders for the stopping of the whole process. And indeed, such rudimentary processes work as the consumers would prefer alcohol from specific areas inhabited by specific chief distillers and chief testers. The process is energy intensive and requires significant amount of “firewood”. The energy needs make the process less commercially viable and is a leading contributor to environmental degradation. Coupled to this is the poor and inefficient hydrolytic and fermentation based processes. Such processes limit the amount of sugar readily available for fermentation. Where the sugars are available, the less optimized fermentation process, involving a whole host of microorganisms, may limit sugar utilization for ethanol production. In addition, these microorganisms may also convert the available sugar into other products, consequently reducing on the amount of ethanol produced. The production of methanol and other lower alcohols also limits the process in addition to affecting the quality of the final product. The Cassava CARP project has been working closely with ethanol producers and cassava farmers in improving the ethanol production procedures and hence their livelihoods. In particular, the project isolated critical microorganisms involved in the ethanol production processes leading to identification of key species of the organisms that are involved. The synergistic actions of these organisms have also been identified. Deployment of specific sets of microorganisms that can enhance the efficiency of these organisms and hence improve hydrolytic and fermentation processes is thus possible. Indeed we have also been able to document and appraise the whole process. Working together with the agronomy team, we have also identified specific key traits that would qualify a particular cassava variety for use in ethanol production. Such varieties have also been identified. Therefore farmers can now select from a range of identified varieties. These can be promoted among the farmers for improved and efficient processes. They can also utilize the information available to increase the hydrolytic and fermentation efficiency for the milled flour. The information can also be used to breed for better varieties specific for ethanol production from cassava. Such adaptable procedures even at cottage level are particularly important for farmers in Apac and neighboring ethanol production areas. 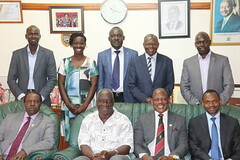 As a project, we acknowledge the support and mentoring from RUFORUM and Makerere University. For more information, visit http://www.cassava-carp.org/. Dr. Ephraim Nuwamanya has 10 years of professional experience in agricultural based studies related to crop compositional analysis, and application in food and feed products development, and plant physiology studies. He has been involved in conducting higher institutional training both at undergraduate and graduate levels, and coordinating research projects.